Sometimes you need to just get in your refrigerator and pull out whatever you have. Start thinking of flavor combinations that you like and go for it. That is what I decided to do tonight. I had a protein I needed to cook and I just worked my way around that. I had some really lovely ground grass-fed beef and a craving for some fresh raw veggies. 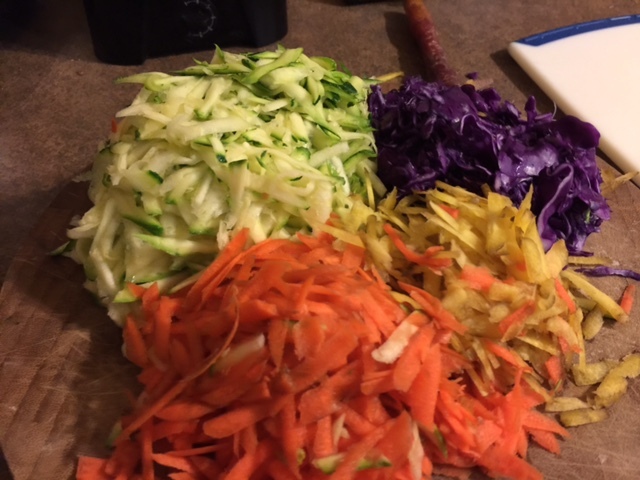 I looked in my fridge and saw green cabbage, zucchini, rainbow carrots, orange bell pepper, onion, and red cabbage. I did a quick peruse of the pantry and grabbed my 2 cans of coconut milk with spices like curry, ginger, onion and garlic powder. 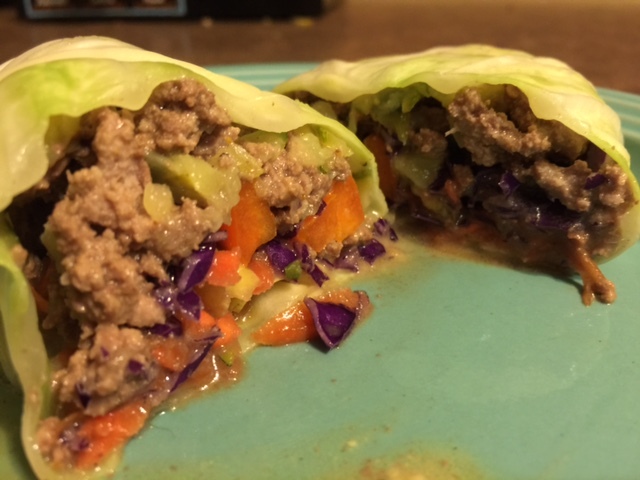 I just started prepping for a coconut curry ground beef cabbage wrap with fresh raw veggies on the inside. I have never made this before and had no real recipe in my head. I decided it was would be best to shred all the veggies, except for the pepper which I cut into thin Julienne type strips. I got the meat going the cabbage cooking and in less than 20 minutes the entire meal was cooked. It came out so good. I love getting in the kitchen and just letting a vision inspire you, with no real direction you just create. I often find the more you stress on cooking something perfect, the more likely you are to “mess” it up. When you create food with love and inspired visions and you just cook, it usually comes out really good. The love and inspiration come through in the food, and those who have the pleasure of eating will feel that with each bite. I really love this new recipe. You can omit the beef and use organic ground turkey or chicken, you could use fish or shrimp, you could use lentils or even just keep it all veggie on the inside. I also decided the next time I make this recipe I will thinly slice and roast sweet potato. Sliced almost like a chip and cooked until soft. I think the sweet potato will add contrast in texture and flavor. I will do that the next time I make the wraps. Until then feel free to try it yourself. Siracha is the perfect hot sauce for this dish, if you like it hot! Cut off the bottom 1/4 of cabbage to expose the core. 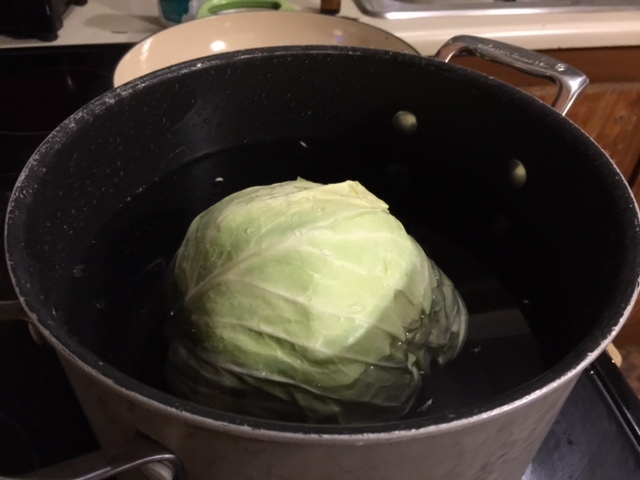 Add the cabbage to a large stock pot filled with water. Bring the cabbage to a low boil. You can use tongs to judge when the leaves are ready to peel off. When you get to that stage turn the heat off and leave the cabbage for a few minutes. Drain the cabbage and set aside to cool. When its cool you can easily separate all the leaves. Boiling cabbage to separate the leaves. Next prep all your veggies. I grated the zucchini, red cabbage and carrots. I Julienne cut the bell pepper. 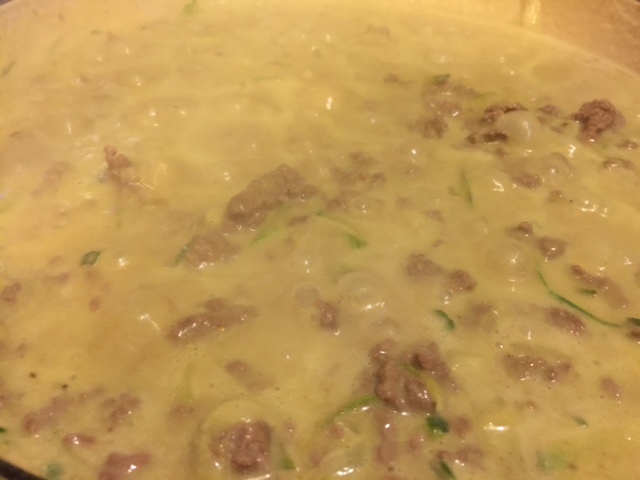 Place your coconut oil in to your hot pan and brown your grass-fed beef, or protein of choice. After it has browned at this stage add in your zucchini. 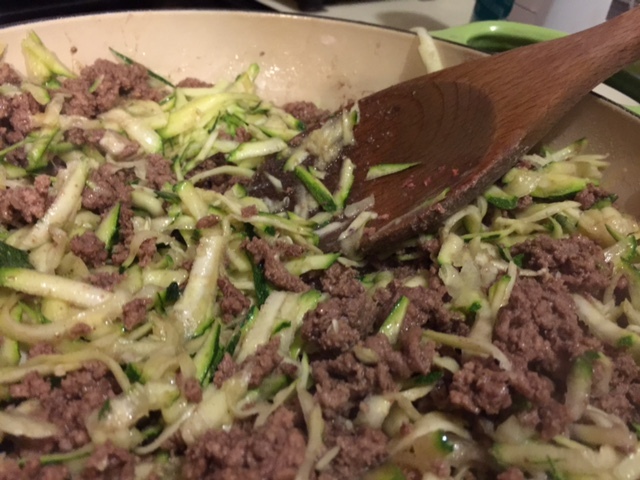 Once the zucchini has softened you will begin to add your coconut milk, salt, pepper and spices. Now comes the fun part. Assemble, warp, cut and eat. So yummy. If you like it hot add some Siracha to the inside of the wrap. I promise you will love these. Kid friendly too!